The first period gets under way and right off the bat, Marc Andre Fleury is tested, many 2 quick saves. Jordan Staal decided, “Hey, I’m going to open up the scoring” and he did. A beautiful power move right up the middle, splitting the defense, one hand on the stick, beats Lehtonen 5 hole. 0-1 good guys at 2:11 Gonchar and Cooke with the helpers. Craig Adams keeps his psychical game going with a couple great checks to the boards. The Pens get their first opportunity on the PP as Grossman is sent to the box for holding at 6:52. Poni gets a chance on the first PP unit, filling in for the veteran Billy Guerin, who was missing his second consecutive game due to back spasms. No dice on the PP, though it looked decent. Mike Riberio ties up the game, when he capitalizes on his own rebound off of Flower’s pad. 1-1 at 12:05. Morrow and Segal with the assists. The boys barley get a shift in before TK goes off for hooking at 12:40, but the PK of the Pens prevails keeping the game tied. The Pens end the first period on the PK again, Talbot is in the box for interference, PK looked good again. Pens start the 2nd period killing off the remaining time on Talbot’s penalty. Though a series of unfortunate events would ensure for the Pens. Kris Letang pinches down to keep the puck in the zone but fails to do so and get caught behind allowing the Stars to go 2-on-1. Free Candy is the d man caught in the 2-on-1, he tries to cut off the pass but Riberio is able to feed Segal the puck. Segal dumps the puck over Flower’s shoulder. A minute later, Lou Eriksson is camped out to right of Fleur and slips one past him. It is now 1-3 in favor of the Stars. At this point people are saying pull Fleury. DB doesn’t agree with them and trusts in Marc Andre. Kunitz, who has been playing a man possessed, become the beneficiary of a beautiful tape to tape passing play of Letang and Crosby, allowing Kuni to rip one over the shoulder of Lehtonen. 3-2. This pumps the boys up no doubt. Marc Andre follows Kuni’s goal with an UNREAL save, robbing Brad Richards. He tells all his haters to screw off with that save. Pens get another chance on the PP, but still dice. A great couple shifts for the boys and it pays off. Kris Letang makes a great play to muscles Richards over the puck to rip a pass to feed Dupes for the goal. 3-3 good guys. Sid wants to get in on the scoring fun and he does. He was just everywhere around the net, he takes a shot that is blocked but gets his own rebound, goes behind the net and slips one past Lehtonen. 3-4 good guys. Craig Adams drops the gloves with Steve Ott, who has been agitating guys all afternoon. Addsy gets the best of the fight. Although the Pens end the second period down two men. The Stars start the third on a 5-on-3. Flower robs Morrow on the door step. Staalzy is let loose form the box and goes on a 2-on-1 with Sid. 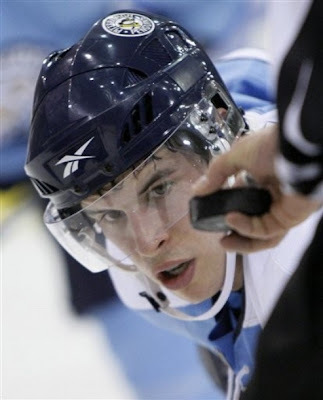 Sid launches a shot over the shoulder of Lehtonen. A nice short handed goal for Sid that puts the Pens up 5-3.The majority of the third was all Flower, making routine and amazing saves. At one point, Flower is bull dozed over and still makes the save. The Pens final capitalize on the PP and who gets the goal but the new guy, Alexi Ponikarovsky ask Poni aka Poni Express aka The Ukraine Train. 3-6 good guys and that folks is your game. Sidney Crosby: 2 goals, the go ahead and a shorted handed. Sid is now leading the goal scoring race with 44. 2 more than Ovechkin. 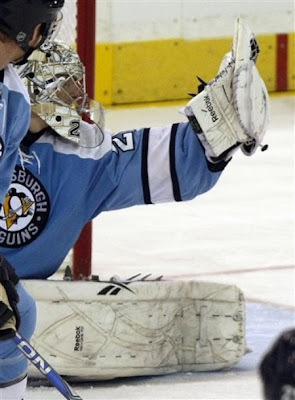 Alexei Ponikarovsky: His first game in the Bylsma system looked very good. Along side Geno and Tenk, Poni created chances and threw some big checks. This guys is only going to get better if he stays on Malkin's line. PK: The Pens penalty kill, has been outstanding. They killed off their fair share of Star PPs today including a 5-on-3. Point Streak: Unfortunately, Geno's point streak has ended at 15 games. Pens are back to business tomorrow as they take on the Boston Bruins. Should be a good one!